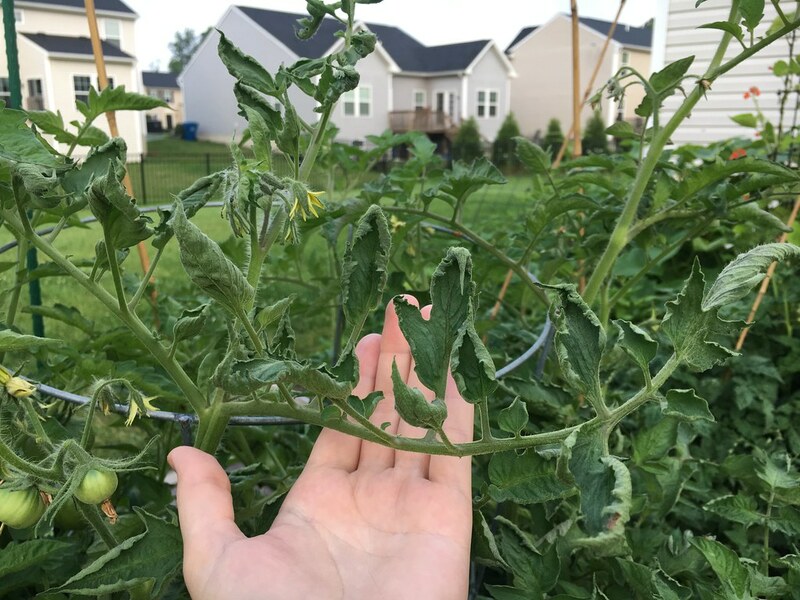 Warning - this is my first garden and first time growing tomatoes! My Pink Berkeley Tie Dye and Galina's Cherry (both grown from seed) are showing leaf curling, and the newer leaves are very curled/deformed. The Galina's isn't as bad as the Tie Dye, but in addition, it has some yellowing leaves. Any help is appreciated! I can give more details or photos if needed. Lower leaves are fine, the upper ones tell the story. I have had it 3 years running. At least you got some fruit set before they got clobbered. Mine suffer from poor set, and terrible catfacing. They will survive by the looks. Some varieties really take it on the chin, others power through. I can kind of tell now when they get clobbered. The leaves fold up along the center vein, then flatten out again, new growth after that is hairball. Looks like herbicide damage at top. I would guess 2,4-D. The bottom leaves just show some PLR (physiological leaf roll). That's pretty normal. The yellowing leaf could just be senescing or it could have a touch of some fungal disease starting. Either way, I would prune that leaf off. 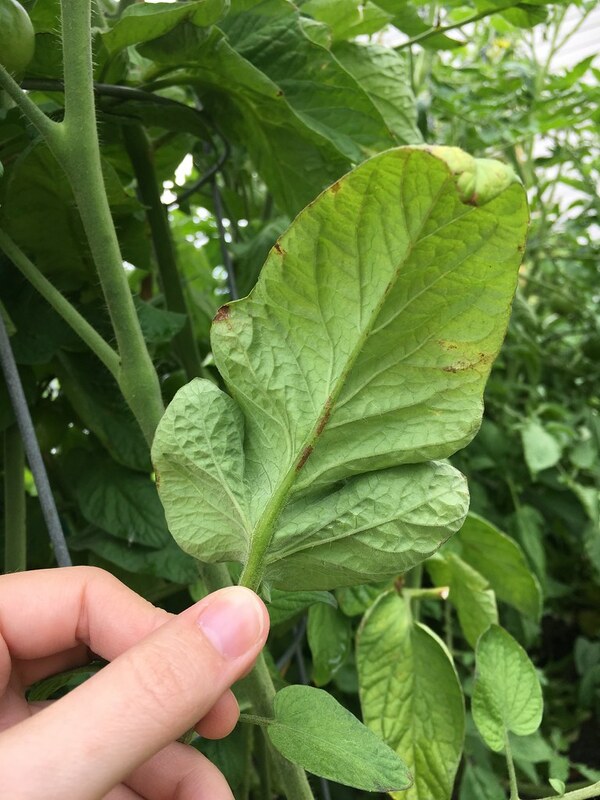 Ditto, the top leaf deformity looks like herbicide drift damage and the lower leaves do look like PLR. The Galina's Cherry leaf looks like it has some aphid damage. See the browning along the leaf veins where they feed. Great, thanks for all the responses! I don't know where the herbicide came from, but I'm glad I know what's going on. 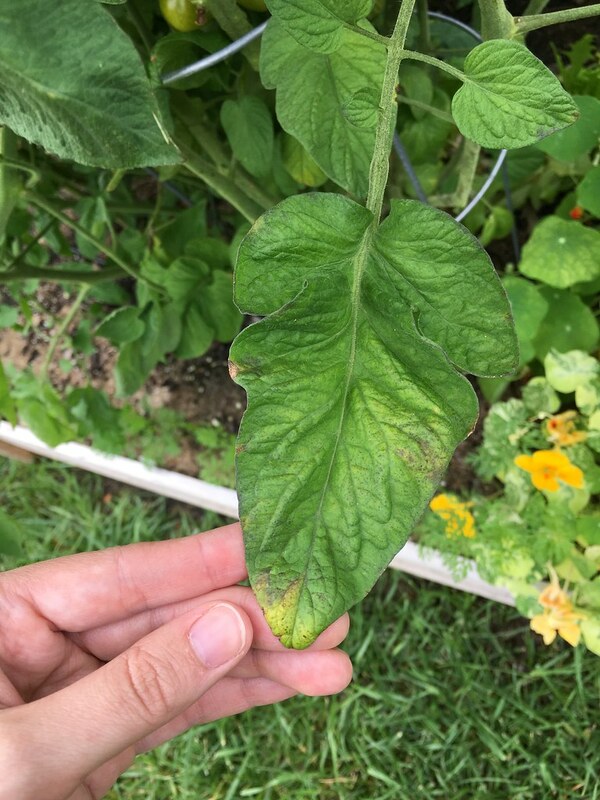 I'll prune off the yellowing leaves, look even more diligently for aphids and read up more on herbicide drift! Thanks everyone! Ok Loligo is a type of squid but you are in Ohio. That requires an explanation please. most of my tomatoes planted in raised beds in my greenhouse have looked exactly like yours for 2 yrs now. I thought it was too much compost (made beds with 60-80% compost), or too rich. Then I thought that it was herbicide residue from some soil my dad brought (agricultural land, he farms). Regardless, all of last year, I had a awesome new 30x15' greenhouse with horrible looking plants. They would produce, but just looked terrible. So, last fall I added a bunch of shredded leaves and worked the soil several times over the winter. It never froze in the heated greenhouse. This spring I had the soil tested at a lab and it was near perfect. I added a little sulfur to bring down the pH a bit, no other ferts were needed. I planted about 12 in-ground tomatoes this spring, and just as many peppers. Results....most of the tomatoes are still curling, exactly like your pictures. Beans, potatoes, peppers, onions and flowers all did AWESOME. I just dug 10 or so 5 gal. buckets of Yukon gold and small red potatoes. Even though the tomato curling looks terrible, I get loads of tomatoes. I've picked 5 gal. buckets of toms. already, so it doesn't seem to affect yield. I also know that it's not herbicide residue in the soil. Beans are extremely sensitive to herbicide, they would have died immediately after germinating. In the closed greenhouse, there would have never been herb. drift. We don't have any neighbors around either. What does all this mean? I'm not sure. Maybe pH? Maybe my occasional feeding Tex. Tom. Food, Tomato Tone? I think it's over fertilizing. For some reason I just can't seem to lay off the ferts. 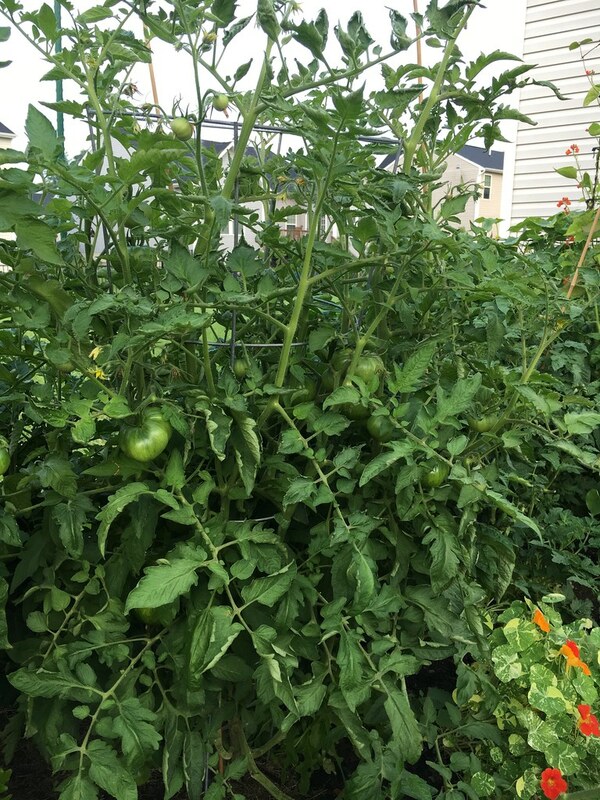 All the tomatoes in containers in the greenhouse can't seem to get enough fertilizer. And, when I'm feeding them, I always tend to feed the in-ground plants, and I'm 90% sure this is causing the leaf curl, but at the same time, really helping yield. I'm with pecker, there's other explanations beside herbicide damage on this one. I had smaller pots with cold root zone temps and wet conditions that led to nutrient uptake problems that displayed in very much the same way. Maybe they're a little wet and had a little too much nitrogen and with carrying a lot of foliage they had a nutrient uptake hiccup. The thing on herbicide it tends to make a chromosomal change, new growth distortion and changes in apical dominance. Even when these plants survive, node spacing changes, fruit production and quality suffer. The new suckers on yours appear healthy, it's an interesting case Loligo, keep us updated. Plants will sometimes outgrow a very light touch of drift. Those sawtoothed/venus flytrap leaf edges in the new growth and the "shepherd's crook" appearance of some of the more tightly distorted newer leaves are very characteristic of herbicide. How long ago did you notice this type of damage? Not the normal leaf roll in the bottom leaves, but the distorted growth in the newer leaves? Also, even if your neighbors don't use sprays, these herbicides are in a lot of lawn care products, and landscaping, lawn care companies will often use them without telling their clients. So if any of the neighbors have had such a company in, that could be the source. Poison ivy removal involved herbicides quite often. And HOAs, etc. might make exceptions in such cases. I don't think that is herbicide damage and if it is it is so mild as to be of little concern. Half my plants do that at some point in the growing season and it doesn't affect their production. Some varieties tend to do it every year no matter what. It frequently occurs with big changes in the weather and temperatures. I have had herbicide drift damage and it will severely affect production and will eventually kill some of the plants though some will outgrow it eventually. After one experience with it where nearly a third of my plants were lost the next time it happened I just pulled the more affected plants immediately as I had learned from the previous time that those more severely affected would never be much good and it was just better to replace them. New seedlings as they are set out and grow can show cupped leaves,upside down leaves, twisted leaves, etc. And that happens when top growth,foliage,is not in balance with root growth. And the plants usually grow out of it. With that insight, which I'm totally feeling. A Carolyn inspired haiku, 'Torn Tomato'. Clip off a few leaves and take them to your local Agriculture pathology department. This will help rule out, or define a problem many times. If your not sure don't guess.